It’s hard to go wrong with a Christmas-themed story because even if you don’t enjoy the story, the setting is bound to steal your heart, but thankfully that was not the case here. 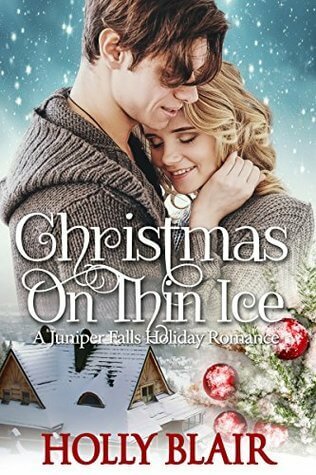 CHRISTMAS ON THIN ICE is heartwarming and sweet romance that reminds us that even the midst of loss, there can be new beginnings. Lily Jordan isn’t having the best holiday season at all. She lost her parents barely a month earlier and now she just found out that she’s pregnant and has been dumped by her pro-golfer boyfriend for a groupie. Finding out that their family Christmas tree farm is on the verge of going under and only an infusion of cash from an outsider can save it is bad news, but even worse is who their savior is – the man who trampled on her teenage heart and another athlete, no less. Noah Wright walked away at the height of his hockey career to give his little girl a good life away from the bright lights of Los Angeles and his hometown is the only place that will do. Saving the small business that helped nurture the seeds of his career is no big deal because he wants his daughter to experience the same childhood he did, but the bigger reason is Lily. Noah has always regretted walking away from Lily ten years ago, but now that he’s back he’ll do anything to win her heart again including some behind-the-scenes manipulation. This story has so much to enjoy about it – a little girl who needs to find the joy of Christmas again and a father determined to make that happen, as well as a woman disillusioned by so much loss who needs to open her eyes and heart to the good that the holiday season has brought her, all set against the backdrop of a charming and quaint farm exploding with holiday fun. The only problem I have with this book is that it wasn’t long enough and the author had to squeeze in so many details that needed more room into a few pages. OLLY BLAIR lives in the Midwest with her husband, son, and two feisty cats. She loves writing small-town romance and creating sweet happily-ever-afters. Born in December, Holly is a self-professed holiday nut. She revels in spending cozy nights nestled next to the fireplace with a good book and a cup of hot cocoa.